The Denis Wick Heritage 2B Cornet Mouthpiece is the mouthpiece for the advancing musician wanting a powerful and expressive tone. Featuring an old school thin cup wall and gold plated top rim, this mouthpiece is great at the quietest dynamics and bold and resonant in the loudest volumes. The 2B mouthpiece offers the cornet soloists with a strong and advanced embouchure a deep and rich sound - a true cornet sound. The Heritage mouthpieces are a revolutionary idea, using as its basis 19th century models with a thin-walled cup nearest to the rim. Modern CNC technology has further reduced the wall thickness to 1.2mm. To this is added a modern idea; greater metal mass at the bottom of the cup. The result is a rich sound, with a scintillating upper overtone structure, incredible responsiveness in very quiet playing and a much easier high register. 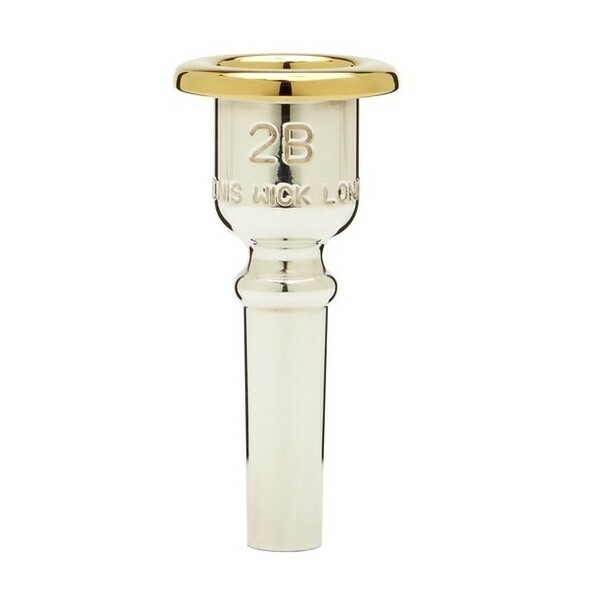 This is a powerful mouthpiece but is also highly responsive. The elegant gold-plating of rim and cup combined with the silver-plated body make this model look as good as it sounds.